Advances in technology can change how certain types of injuries are classified. For instance, whiplash was once referred to as “railway spine” when trains were the preferred mode of transportation. Injuries from excessive neck craning were once more likely to affect individuals who had to lean forward to perform certain work-related duties or repetitive tasks. 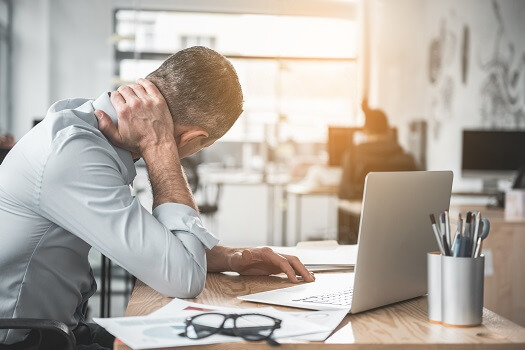 Today, the widespread use of handheld devices involving forward head-neck movement has resulted in related discomfort being commonly referred to as “tech neck.” If you happen to be a frequent gadget/device user, here are five things you can do to prevent tech neck pain. You’re more likely to be straining your neck, upper back, and shoulder muscles if you’re in the habit of holding your device somewhere around your belly or mid-torso area. Instead, keep your tablets and smartphones at eye level when using them. If you’ll be using your tablet or laptop for a long time, consider using a holder or placing the device on a table or desk that’s high enough so you don’t have to bend your head and neck forward. Bonus Tip: If you know you tend to lose track of time when doing anything involving a screen, set the alarm on your phone to remind you to take breaks. The easiest way to be more mindful of your head-neck alignment is to use an ergonomically designed chair with a headrest. This way, if you notice your head slowly inching forward and further away from the headrest as you use your device or laptop, you’ll know it’s time to lean back again and get into the correct alignment. It may take some time, but eventually you should be able to get into the habit of looking at your screen while still keeping your head flush against the headrest. If you’re having severe or chronic neck pain, seek the advice of a spinal health specialist to get a proper diagnosis and personalized treatment plan. The pioneering spinal health experts at The Spine Institute lead the industry, using the most innovative methods to treat all forms of neck and back pain. Reach out to our friendly staff today at 310-828-7757 to schedule a consultation.